JetSuiteX, the acclaimed air carrier that offers regular flights from private terminals at the cost of a commercial ticket, announced that it will become the first carrier to offer SmartSky Networks’ innovative inflight internet solution, which gives customers the ability to stream, email, transmit large data files, and text with speeds comparable to their experience on the ground. Alex Wilcox, Co-founder and CEO of JetSuiteX, announced the partnership at the APEX TECH event in Los Angeles, Calif. during his keynote address. “After a rigorous selection process including my personal inflight evaluation, we chose SmartSky’s state-of-the-art, high-speed technology because it delivers the most compelling user experience,” said Wilcox. The ground-based components of the SmartSky system are being deployed throughout the contiguous United States using a mix of 4G LTE and emerging 5G technologies, similar to some of the recent improvements in terrestrial cellular networks. 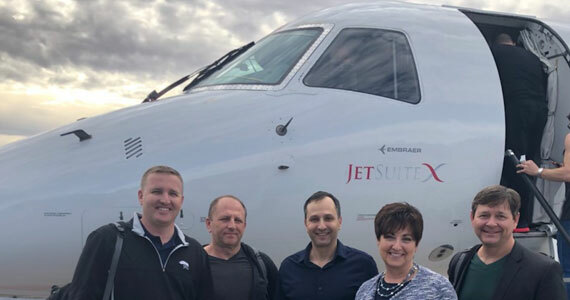 JetSuiteX plans to launch the service in late summer 2019 with a phased roll-out across their rapidly growing fleet. APEX Ad Delivery Working Group: The need for a standardized language regarding ad delivery and a glossary of terms was addressed during this meeting. Advertisers expect consistent analytics across platforms. Ad-ID, DSR Corporation, Google, Global Eagle IAB Tech Lab, Inadvia, Kantar Media, PXCom, and Touch Inflight were representatives on this panel. Which Is the Right Codec to Use When? Video codec compresses digital video in order to fit a specific space-limited storage, think DVD as an example, then the file is decompressed for playback. It also facilitates efficient delivery of said file, either via broadcasting, the Internet, or an IFE system. Data is lost during the compression process, so new codecs continue to be introduced in an effort to reduce the loss of data. The Versatile Video Codec (VVC), which is a new advanced codec is under development. This group took an in depth look at the technical advantages and disadvantages of new distribution codecs, specifically with regard to how they pertain to the IFE industry. 0415 Part 2 Working Group Shares Updates on 4K Security Requirements: Established in June of 2018, the group has compiled a list of security requirements for handling 4K content. Definitions for content value and the related security standards for each were shared during this meeting. A new category for playing 4K content on PEDs was also introduced. Forensic watermarking (a digital signature that identifies the rightful owner while not being detected by the human eye) may be called for in the future. IFE Content Delivery’s Journey to the Cloud: This panel focused on the various aspects of the IFE content workflow that could be processed via the cloud. One potential area that could benefit from cloud delivery is classic movies, which primarily have a fixed configuration, being called into rotation as needed. Star Alliance Creating a Digital Travel Ecosystem: Star Alliance CEO Jeffrey Goh opened the second day by introducing the audience to the digital services platform that is under development by their 28 airline members in an effort to make air travel among their alliance more seamless for the passenger. Mr. Goh stated that their organization has shifted their focus to digital technology and the customer experience. A digital services platform enables their partnership to share a vast amount of information with each other and their customers. JetBlue & Biometric Boarding: JetBlue has boarded 8,000 passengers using biometric boarding since November 2018. The key to the high adoption rate is the passengers understanding of how the airline handles their data. Passengers must feel that their information is secure and that it isn’t stored. Ramki Ramaswamy, vice-president of IT, Technology and Integrations for JetBlue, indicated the airline hopes to test a biometric bag drop service before the year’s end. Thinking of Air Travel as the “Fourth Place” in Our Lives: David Bartlett of Panasonic Avionics discussed the “fourth place” concept with Joe Leader. Traditionally, home, office and community have been viewed as the three pillars that define our lives, now Panasonic has introduced the concept of a fourth ecosystem – air travel, where the three begin to converge. Bartlett stated that the Panasonic open-platform facilitates collaboration with other technology providers, creating the fourth-place – think about the Wellness suite Panasonic debuted at APEX in Boston. APEX Connectivity Working Group Invites Input to Help Define In-Flight Wi-Fi Quality: 12 months ago, this working group thought to standardize in-flight connectivity, now the Connectivity Working Group is focused on “defining how to best measure the passenger experience”. The group is also considering the definition of IFC service availability and is planning on introducing metrics to quantify the experience. There was a follow-up discussion on how other industries, like the mobile sector, measure connectivity performance. Bernd Knobe, managing director, P3 Aero Systems, discussed one option would be an application that could run on PEDs (either the flight crew or pax) that would gather onboard connectivity performance data, then upload it to the cloud for additional analysis. Again in 2018, Thales was included in the Top 100 Global Innovators list published on 23 January by Clarivate Analytics. In the last eight years, Thales has appeared six times in this prestigious ranking, which recognizes the volume, success and influence of our patents. This achievement underlines the company’s commitment to innovating, protecting our ideas and bringing our inventions to market. The Thales portfolio, which includes more than 15,000 patents, is regularly adapted to operational requirements. In 2018, we filed almost 350 new patent applications. Passengers departing from Miami International Airport to Munich on Lufthansa flight 461 can now board with the quick click of a camera instead of a boarding pass and passport, thanks to the airport’s launch of biometric exit technology last week. Through a partnership between MIA, Lufthansa, U.S. Customs and Border Protection (CBP) and global air transport IT provider SITA, a simple photograph taken at Lufthansa’s boarding gate is used to confirm passengers’ identities and their authorization to travel. The facial recognition verification process takes less than two seconds with a 99-percent matching rate, according to CBP. MIA expects to launch biometric boarding with additional airlines this year. The launch of biometric exit at MIA follows the airport’s February 2018 opening of America’s first all-biometric entry facility at Concourse E, which screens all international arrivals via facial recognition. The facility, which has decreased processing times by as much as 80 percent for participating airlines, was chosen from among 80 nominations worldwide as the 2018 International Airport Review Award winner in the Passenger Experience and Seamless Travel category. SITA and MIA have already partnered on a number of innovative travel experience solutions, including Mobile Passport Control and MIA Airport Official, the airport’s mobile app. American Airlines took delivery of the first of 100 A321neos on order from Airbus, powered by CFM LEAP-1A engines. The aircraft, MSN8647, departed Hamburg early Friday for the trans-Atlantic ferry flight to Pittsburgh where American’s technicians will get the A321neo ready for customer flights. Emirates – Airbus SE confirms it is in discussions with Emirates Airline in relation to its A380 contract. The details of Airbus’ commercial discussions with customers remain confidential. Cybersecurity: Airbus SE detected a cyber incident on Airbus “Commercial Aircraft business” information systems, which resulted in unauthorized access to data. There is no impact on Airbus’ commercial operations. This incident is being thoroughly investigated by Airbus’ experts who have taken immediate and appropriate actions to reinforce existing security measures and to mitigate its potential impact, as well as determining its origins. Investigations are ongoing to understand if any specific data was targeted, however we do know some personal data was accessed. This is mostly professional contact and IT identification details of some Airbus employees in Europe. The company is in contact with the relevant regulatory authorities and the data protection authorities pursuant to the GDPR (General Data Protection Regulation). Airbus employees are being advised to take all necessary precautions going forward. Japan’sANA Holdings Inc said last week it would order at least 38 planes worth $4.33 billion from Boeing Co and Airbus, and buy a stake in Philippines Airlines’ parent PAL Holdings Inc to support its Asia growth strategy. The order, confirming earlier Reuters reports, is the first in Japan for the newest version of Boeing’s best-selling 737 family and comes at a time when the country is facing pressure from Washington to cut its trade surplus with the United States. It also raises the stakes in a battle for orders of the industry’s largest category of airliner, allowing Boeing to weaken a bridgehead held by its European rival Airbus in the narrowbody fleet of one of its most strategic customers. ANA had been the first airline from Japan to pick Airbus’ latest narrowbody aircraft five years ago. The airline, which saw its international revenue spike 11 percent in the December quarter compared with a 0.5 percent rise at home, also announced an investment of $95 million for a 9.5 percent stake in PAL in line with its Asia push, saying it was confident in the Philippines’ growth prospects. ANA’s purchase of 20 737 MAX jets is worth $2.3 billion, while its order for 18 A320neos is worth $2 billion at list prices. Airlines typically get large discounts. ANA said it had options for another 10 737 MAX, bringing the potential U.S. part of the deal to 30 aircraft. Boeing shares rose 0.5 percent with Airbus up 0.7 percent. The world’s top planemakers have amassed thousands of orders for their narrowbody jets, with Boeing chipping away at its European rival’s recent lead. Earlier this month it poached Saudi budget carrier airline Flyadeal from Airbus, while Airbus won the last round of a prolonged battle over Vietnam’s VietJet. ANA’s mixed narrowbody fleet had previously been expected to shift to all-Airbus as older 737s were retired. Budget offshoot Peach, which will take the A320neos, has an all-Airbus fleet. Boeing dominates the count among ANA aircraft with more than 100 seats at 81 percent as of March 2018. Think you have been one of the 8 million internet accounts hacked? Try hear to see if you were – Identity Leak Checker And yes, we have been getting targeted fake emails requesting a link to be clicked! Reed Exhibitions today announces the launch of Passenger Technology Solutions (PTS), a global must-attend event that showcases and explores the technology that is transforming the passenger journey. PTS will take place during Passenger Experience Week, running from 10th-12th April, 2018, and will be co-located at the Hamburg Messe alongside the Aircraft Interiors Expo and World Travel Catering and Onboard Services Expo. With competition for passenger loyalty fiercer than ever, the provision of technologies that enable a more seamless inter-connected journey to passengers are key to ensuring transport operators have a competitive edge. Passenger Technology Solutions is designed to provide bespoke technology suppliers with the perfect platform for showcasing their products and services to airline and rail operators from around the globe. In addition to the many industry-leading companies set to exhibit at Passenger Technology Solutions, visitors will hear inspiring keynotes around hot topics such as “Is the CXO (Customer Experience Officer) the new CEO?” and participate in debates on whether to be a trend setter or a trend spotter. This fully interactive event will set the agenda for travel in 2018 and beyond. “The launch of Passenger Technology Solutions comes at a transformative time for the passenger experience industry. Today’s passengers not only expect the same level of connectivity and seamless communication throughout their journey as they have at home or in the office, they now demand it. Passenger Technology Solutions will take place during Passenger Experience Week 2018 which takes place in Hamburg, Germany, from 9th to 12th April. In recent years, the event has grown to consist of a conference, a networking party and 3 expos. Each year, Passenger Experience Week attracts over 18,000 visitors from across the world, along with over 2,000 VIP airline attendees and more than 180 unique airline and lessors. Former GE Aviation and IBM executive to lead technological innovation. Lake Forest, CA | August 23, 2017– Panasonic Avionics today announces the appointment of David Bartlett as its new Chief Technology Officer (CTO) and Chief Information Security Officer (CISO). Over the course of his career, Bartlett also held several management positions at IBM including Director of IBM Europe Software Development Lab, and Vice President of Europe, Middle East and Africa Support and Services. He led IBM’s Autonomic Computing program strategy at the IBM Thomas J. Watson Research Center. As IBM’s Vice President of Smarter Physical Infrastructure, he led digital projects in transportation, smart grid, and smart buildings where he was named one of the ‘top 15 people in the world to watch’ in intelligent buildings. Bartlett earned his Bachelor’s Degree in Biology and Chemistry at New York State University and completed the Computer Science Masters Program at the University of Minnesota. He earned an Executive MBA from the Kenan-Flagler Business School at the University of North Carolina and holds a PMP Master’s Degree from George Washington University. Air Transport World (ATW) has honoured NAVBLUE with the Aviation Technology Achievement Award as part of their 2017 Annual Airline Industry Achievement Awards. The Award is one of the most coveted awards in the aviation industry. Waterloo, ON | January 24, 2017– NAVBLUE has been nominated by a prestigious ATW editorial board of judges for its N-Flight Planning Solution. This award is given to a breakthrough system, technology or process that advances safety and efficiency in the global commercial airline industry. NAVBLUE’S N-Flight Planning solution uniquely allows airlines, with its integration of a flight planning route optimization algorithm and Schneider Electric’s flight hazard forecast model, to operate more safely and efficiently – flight crews get advanced warning of areas to avoid that may contain turbulence, icing or storms – correspondingly offering greater customer and crew comfort along with a cost optimized route of flight. The awards will be presented at the 43nd annual ATW Airline Industry Achievement Awards at a gala dinner on March 28 at the J.W. Marriott Essex House in New York. London, UK | September 22, 2016– A career in the rapidly expanding space industry is not just about launching and flying spacecraft according to Inmarsat, a world leader in mobile satellite communications. Announcing the company’s search for its next generation of ‘space pioneers’, the company’s Chief Technology Officer (CTO), Michele Franci, emphasised that to remain a global leader, Inmarsat is focused on attracting world-class engineering talent. Inmarsat’s third ‘Technology Development Programme’ (TDP), which was launched today at New Scientist Live in London with British ESA astronaut Tim Peake and graduates from Inmarsat’s second TDP programme, is designed to start the space engineering careers of five STEM (Science, Technology, Engineering and Maths) graduates. The winning candidates, selected from UK and European universities, will have the opportunity to undertake a two-year placement with Inmarsat and the offer of a permanent position on the successful completion of the programme. Applications for the 2017-2018 programme were officially opened at New Scientist Live in the presence of Tim Peake and will close on 31st January 2017. The successful applicants will join Inmarsat for their two-year placement in September 2017. Those who join the programme will have the opportunity to work across a range of specialised teams at Inmarsat, including space system development, system architecture and strategy, service and network engineering, spectrum optimisation, cloud virtualisation and satellite operations. Predominantly based in London ay Inmarsat’s global headquarters, the role also offers opportunities to work in the company’s offices in the US and Europe. Part of Inmarsat’s first generation of TDP graduates, Guillaume Marrakchi, described his experiences as part of the programme in a new blog. I was one of the lucky five young graduates who joined the first generation Technology Development Programme (TDP) in 2015. So far, the TDP has given me the opportunity to work on challenging and fascinating projects at the forefront of space telecommunications, ranging from future space systems engineering to advance predictive traffic modelling simulations. This was something I could only imagine doing as an aerospace engineering student back in university in Toulouse. Whilst there, I remember reading about the ‘new space era’ and about this thriving thirst for innovation in the space industry, especially in the domain of telecommunications. Now after only a year of rotations within Inmarsat, I definitely see this company as an exciting place to start a career and take an active part in this new era. Guillaume’s full blog can be found at www.inmarsat.com/blog/working-at-the-forefront-of-space-telecommunications. Itasca, Ill. | June 1, 2015– Gogo (NASDAQ:GOGO), a leading global aero communications service provider, announced today that it has been named 12th on this year’s Crain’s Chicago Business Fast Fifty list, which is a compilation of the fastest growing companies in Chicago. Gogo moved up seven spots from last year’s ranking. Gogo was recognized by Crain’s after delivering a five year revenue growth of 1009 percent. You can view the full list of companies that made Crain’s Fast Fifty List here.